I am back with another book review, today it is The One Memory of Flora Banks by Emily Barr. Thanks so much to Penguin Random House Canada for sending me an ARC fo this book for an honest review. As always, all opinions are my own. This story was a weird one for me - and I can't decide if it's a good weird or a bad weird. The book follows 17-year-old Flora. 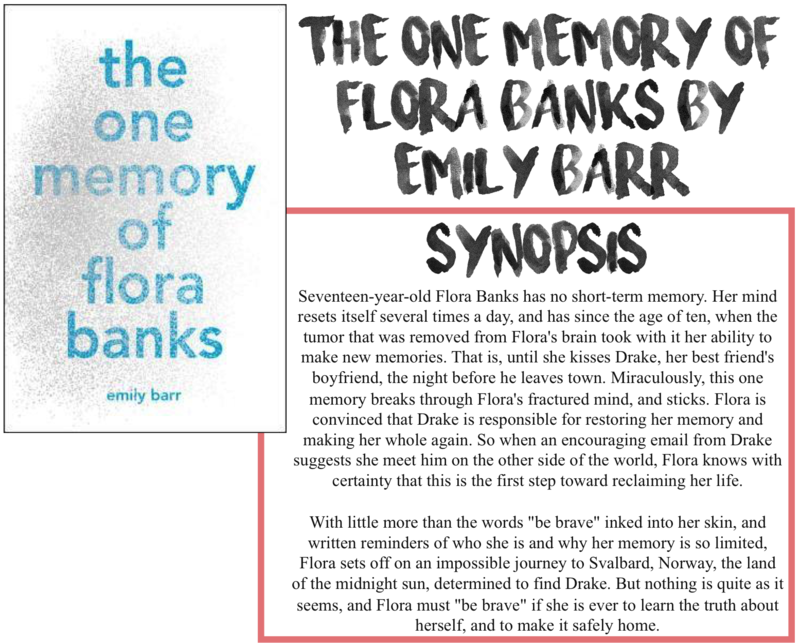 When Flora was ten, she had a tumor in her brain that had to be removed, leaving her with anterograde amnesia, basically, she remembers things that happened before the surgery, but is unable to make new memories afterward. Until one night, when she kisses her best friend's boyfriend Drake on the beach after his going away party and, when her other memories fade a few hours later, she remembers the kiss. And when her parents have to take an emergency trip to see her older brother, Jacob, in France, they leave Flora with Paige, the friend they don't know isn't speaking to Flora. After emailing back and forth with Drake, Flora decides to meet him in Norway, where he is studying. There's more to the plot but I'll leave it at that for now. It took me a little bit to get used to the writing style of this book. Every once in a while, Flora would lose her memory and had to reorient herself. That kind of jarred the narrative at times, having to hear the basics over and over. It did, however, give an impression as to what life is like for Flora. Maybe it's just the cynic in me, or perhaps because I haven't lived with amnesia like Flora does, but I thought chasing down Drake because she was in love and remembered their kiss was a bit far-fetched to me. I was a little skeptical of the relationship from the get go. Not only was he Paige's boyfriend, but he'd only been in the country a little while in the first place. It was like a strange sort of insta-love that happened before the book started. Also, I'm willing to bet that falling in love isn't going to cure your LACK OF BRAIN TISSUE. Just saying. I don't think I liked Flora's character as much as I should have. She felt very young, younger than 17, but I suppose that is because she sometimes gets stuck in the time for the surgery when she was ten. But I just found her extremely naive and annoying at times. I pretty much figured out the plot twist with the parents fairly early on, at least part of it. They just seemed off - at least in the few chapters we saw before they left. It's the typical absentee parents of YA, but with a 'good' reason. In the end, I understand why they didn't bring Flora with them, but I thought it was extremely far-fetched that they would leave her with her friend, and not even check in with the friend in person before leaving. But I suppose if they did, there wouldn't be a story. I guess the big problem I had with this book was that I was expecting so much, and it was just meh. There were some intense moments throughout the book, but they all seemed to resolve themselves fairly quickly and easily. The concept was really amazing, and I've read other amnesia books that are done well, I just don't think this was one of them. Overall, I wanted to love this book, but I think it missed the mark for me.